Sanmar has a long-standing association with tennis. N Sankar, Chairman - The Sanmar Group, N Kumar, Vice Chairman and Vijay Sankar, Deputy Chairman, have lent their support to the sport in many ways and have played a key role in ensuring the success of the Tamil Nadu Tennis Association in Chennai and such prestigious events as the Chennai Open. The Sanmar Group was the first sponsor of TATE (Tamil Nadu Academy for Tennis Excellence), the coaching arm of TNTA. With support from Sanmar, young tennis aspirants have the opportunity to train and excel in the sport. Sanmar also sponsors the Sanmar Inter-club League Tournaments in the men’s and veterans’ categories. Vijay Sankar, Deputy Chairman of The Sanmar Group and Vice President of the Tamil Nadu Tennis Association (TNTA), was the chief guest and gave away prizes to the winners of Adidas-TTT (Triangle Tennis Trust) National Sub-Junior Clay Court Tennis Championships 2013 held on 17 August 2013 at YMCA Nandanam. 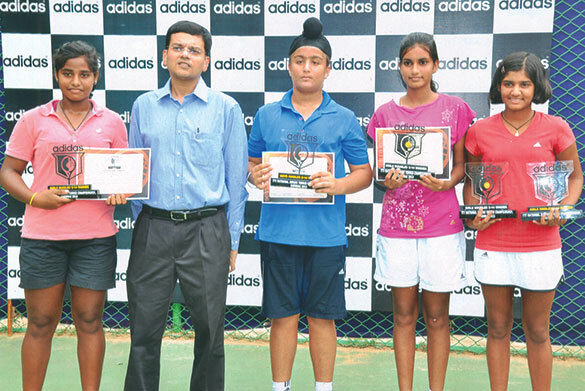 Winners of the Adidas-TTT Sub-Junior Nationals (from l to r): GS Vasavi - Winner Girls U-14 Singles, Vijay Sankar, Sumit Pal Singh - Winner Boys U-14 Singles, Sai Avanthika/Snehal Mane - Winners Girls U-14 Doubles.